Here's where you can learn about the official Walt Disney World Resort hotels. We'll quickly explain a bit about the value, moderate, and deluxe resort categories and give you a brief description of each hotel to help you narrow down the best options for your vacation. Click on the name of the hotel to be taken to more details and photos of that hotel. Disney World Value Resorts: The value hotels have the smallest rooms but they also have the smallest price tag. Big, bold and colorful icons make these hotels a hit with kids and, in many ways, are the most "Disney" of any of the resorts. Pools are themed but do not have pool slides. Each of the resorts has its own cafeteria style food court but no full service restaurants. These resorts enjoy the same great Disney benefits as the moderate and deluxe resorts at a much lower price point - benefits like poolside activities, extra magic Hours, free parking, and complimentary transportation to the Disney theme parks and airport. Standard rooms have two double beds can accommodate four guests + one baby. Rooms with one king-size beds may also be available. You can also book FASTPASS+ reservations 30-days ahead of non-Disney hotel guests, 60 days prior to arrival. Family suites can accommodate six guests + one baby. Great choice for guests watching their budget or people who spend most of their time in the theme parks. Disney’s All-Star Resorts – These are the original value resorts and guests are allowed to use the pools at any of the three hotels. Depending on the type of promotion offered, Disney's All-Star Sports and All-Star Music Resorts may be the least expensive resorts on Disney property. Disney's All-Star Music Resort has the least expensive family suites on Disney property. Disney's All-Star Movies Resort is very Disney, very cute and the Buzz and Woody buildings are popular with Toy Story fans. Disney’s Pop Century Resort – Bright and fun theme, this centrally located resort is also within easy walking distance of Disney’s Art of Animation resort – giving guests another dining location. Bus transportation here is better than at most other Disney resorts, even moderates and deluxes. Disney’s Art of Animation Resort – This is where you’ll find the most elaborate Disney theming – you’ll feel like you’ve stepped right into Finding Nemo, Cars, The Lion King or The Little Mermaid. Most of the rooms here are family suites but there are a few standard rooms. Considered a “Value-Plus” resort, it costs a bit more than the other value resorts. 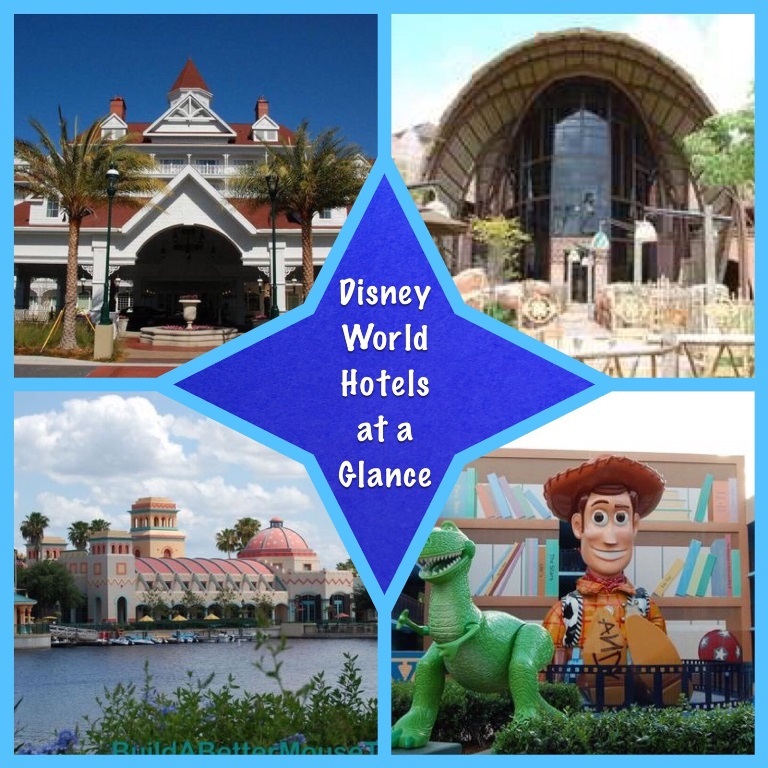 Disney World Moderate Resorts: These resorts are a bit bigger, the decor is a bit nicer, standard rooms have queen beds and the resorts are more elaborately landscaped than the value resorts. The pools have slides and the resorts have more dining or entertainment options. These hotels have more of a resort feel while keeping you in close proximity to all the magic and benefits Disney World has to offer. These hotels are a great option for guests' whose budgets allow for a nicer resort experience but who don't want to go all in for a deluxe resort. Disney’s Port Orleans French Quarter and Port Orleans Riverside Resorts – These neighboring resorts offer boat transportation to Disney Springs (formerly called Downtown Disney). Guest can use the pools and services at both resorts. Disney's Port Orleans Riverside Resort has a food court and table-service restaurant while Disney's Port Orleans French Quarter only has a food court; both resorts offer live music in their lounges on select evenings. Disney's Port Orleans Riverside Resort has some rooms that can accommodate five guests, if one guest is age nine or younger, making it one of the two most economical choices for a family of five. Disney's Port Orleans Riverside Resort also has some delightfully themed princess rooms that cost a little extra but are absolutely delightful. Disney's Port Orleans French Quarter is the smallest of the moderate resorts, making it a favorite of families with small children who appreciate the shorter walk to their room after a long day of fun in the Disney World theme parks. Disney’s Caribbean Beach Resort has some rooms that can accommodate five guests, if one guest is age nine or younger, making it one of the most economical choices for a family of five. It has the most elaborate pool and splash zone of any of the moderate resorts, rivaling the pools at some of the deluxe resorts. This resort also has some rooms that can accommodate five guests, if one guest is age nine or younger, making it one of the two most economical choices for a family of five. Disney’s Caribbean Beach Resort has some very fun pirate themed rooms - these rooms cost a little extra and are in the buildings that are furthest from the main services area but they're also very cute. Disney’s Coronado Springs Resort is a convention center resort and has the largest rooms of the any of the moderates. It has the best food court on Disney property, a fitness center and a very nice pool. This resort is part of one of the Disney World conference centers which means that it has a more adult feel than many of the other hotels though families will love the beautifully themed pool and fun playground. Cabins at the Fort Wilderness Campground – These cabins have full kitchens, are the most economical lodgings in the Magic Kingdom resort area and can accommodate up to six guests. These are usually the most economical accommodations in the Magic Kingdom resort area. We love the cabins and all of the activities available at the campground but some people prefer a more hotel/resort experience than the “in the woods” feel the cabins provide. Tent and RV campsites are also available, including campsites on pet-friendly loops. Disney World Deluxe Resorts: These resorts have the biggest rooms and the most amenities - things like multiple restaurants, elaborately themed pools, spas, more entertainment and more services. These hotels are closer to the theme parks, providing the most convenience and a definite resort experience but they also come with the biggest price tag. A great option for people who want to enjoy their resort but possibly not worth the cost for guests who will spend most of their time in the theme parks. Magic Kingdom – Monorail Loop Hotels: Disney's Contemporary Resort, Disney's Polynesian Village Resort and Villas, and Disney's Grand Floridian Resort and Villas are close to the Magic Kingdom and are serviced by the monorail. Some rooms have Magic Kingdom views and all guests can view the fireworks and Electric Water Pageant from the marina areas of these resorts. All three have on-site character meals and other dining options. They all also have some studios units with kitchenettes and one and two bedroom villas with full kitchens in addition to the standard hotel rooms. Disney’s Contemporary Resort is one of the original two Disney World hotels and is within walking distance of the Magic Kingdom – it is special in that the monorail stops in and passes through the main tower of the hotel. The Garden View/Garden Wing rooms are not in the main tower but are typically the least expensive rooms on the monorail loop. Disney’s Polynesian Village Resort is the other original Disney World hotel and it has a fun Hawaiian feel and features two nicely themed pools. Disney’s Grand Floridian Resort and Spa is Disney’s World’s flagship resort and it is very pretty with live music in the lobby and an elegant “Old Florida” resort feel. The pools are lovely and younger kids love the Alice in Wonderland themed wet play, splash zone area. Disney’s Wilderness Lodge is another resort in the Magic Kingdom resort area but it is not on the monorail loop and you cannot clearly see the Magic Kingdom fireworks, though you can see the nightly Electric Water Pageant. The rooms are typically less expensive than the monorail loop hotels and this resort frequently wins “best family resort” awards and has one of the highest rates of returning guests. This resort also has studios units with kitchenettes and one and two bedroom villas with full kitchens in addition to the standard hotel rooms. Epcot Resort Area: These resorts are within walking distance of the International Gateway entrance to Epcot’s World Showcase area. The close proximity of these resorts gives guests a great variety of convenient dining and entertainment options. Disney's Beach Club and Boardwalk Resorts have studios units with kitchenettes and one and two bedroom villas with full kitchens in addition to the standard hotel rooms. Disney’s Yacht and Beach Club Resorts share an incredible and huge sand-bottomed pool that includes a beach area, lazy-river, and pool slide. Both of these hotels enjoy a beautiful view of the Boardwalk Inn and are in easy walking distance of Epcot's International Gateway entrance. Disney’s Boardwalk Inn and Villas has restaurants, shops, and entertainment venues to keep you busy without ever stepping into a theme park. Walt Disney World’s Swan & Dolphin resorts are also in this area and they’re lovely but they’re not Disney-owned so they do not participate in Disney’s Magical Express, free parking, or the Disney Dining Plans. They can be less expensive than the other Epcot resorts and we're happy to book either of these beautiful resorts for you. Disney's Animal Kingdom Lodge – Jambo House & Kidani Village are near Disney’s Animal Kingdom theme park. This is a “stand alone” resort which means you don’t have other nearby resorts to offer convenient dining and entertainment but it also means you get less non-resort guests wandering through the public areas of the resort. This is a gorgeous resort with savanna areas featuring animals like giraffes, bongos, flamingos and zebras. Jambo House has standard hotel rooms, studios units with kitchenettes and one and two bedroom villas with full kitchens in addition to the standard hotel rooms. Kidani Village only has studios units with kitchenettes, and one and two bedroom villas with full kitchens – it does not have standard hotel rooms. Disney’s Saratoga Springs Resort and Old Key West Resort are near Disney Springs (formerly called Downtown Disney). These are “Disney Vacation Club” (DVC) properties featuring studios units with kitchenettes and one and two bedroom units with full kitchens; these resorts do not have standard hotel rooms. When booked as part of a Disney World vacation package, these units have daily maid service. The resorts are large and have beautiful pools. Because they have kitchens, they do not have as many restaurant options as the other deluxe resorts. Disney's Saratoga Springs Resort has some secluded freestanding “Tree house” units that can accommodate up to nine guests. Disney ‘Good Neighbor’ Resorts: Disney has partnered with select hotels that allow you to create packages without staying in one of the official hotels and some (mostly located in Disney Springs) offer on-site benefits like Extra Magic Hours, complimentary shuttles to the Disney theme parks, and the opportunity to book FastPass+ reservations up to 60-days in advance when you purchase tickets separately or as part of a package. These hotels may have separate resort fees and onsite parking expenses. Disney Springs area hotels that enjoy these benefit: B Resort & Spa, Best Western Lake Buena Vista, DoubleTree Suites, Hilton Buena Vista Palace, Hilton Lake Buena Vista, Holiday Inn Orlando – Disney Springs, and Wyndham Garden Lake Buena Vista. Epcot area resorts that enjoy these benefits: Disney Swan and Dolphin hotels. Active duty and retired U.S. military members with a current military ID and select DOD employees can make reservations at the Shades of Green military resort in the Magic Kingdom resort area. Our agents can help you plan a great vacation at any of these Good Neighbor hotels except Shades of Green.